← By Jove I think she’s got it! I have just returned from the first test run of the Good Ship Touring Bike. 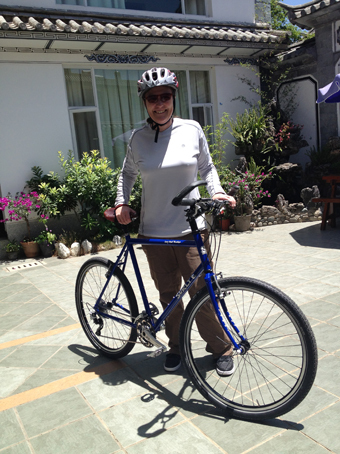 After months of research, ordering parts, the interminable wait for the Chinese postal system, teaching myself about building bicycles and then actually putting one together, the deed is done. The bike that will carry me from Beijing to Melbourne is finally functional! Given that I depart from Beijing in 58 days, the timing is good. It will give me 5-6 weeks of proper training to get everything settled before the big trip, and I’m guessing there will be plenty of tweaking required to get the optimal set-up for me. Of course I need to get used to riding a touring bike, which has a longer wheel-base than other types of bicycles, then I need to get used to riding that bike fully loaded with all the “stuff” necessary for a long-haul journey. It has been an incredibly busy few months since my last epistle. I’ve been flat-out working alternately on the bike, the website, fundraising, and planning the actual trip. I’ve only been out a handful of times on the cheapo training bike I bought in January so I’m a little behind on the actual cycling training, but now the bike is ready the lake and mountains around Dali will be my playground over the next little while. As I’ve mentioned before cycling in China is exhilarating, but not always for the right reasons. I’ve been living here for almost two years and I’m still trying to work out if there is a system for road traffic, you know rules and other boring but helpful things that control where and when vehicles and pedestrians will move. As far as I can tell, a Chinese driving school focuses mainly on teaching their students how to use the horn. In Australia, we use the horn to remonstrate when we feel we have been slighted. In China, the horn is used to let everyone else (fauna included) know you are there, and sometimes just for fun. I’m still not used to it, I keep thinking they are telling me off for something. Nominally, the traffic travels on the right hand side of the road here, but it pays to have 360 degree vision as it can come from literally anywhere. I have yet to see a Stop or Give Way sign, and it appears that everything in front of you is your responsibility to avoid. So if a car pulls out from a side road on to a freeway, it is the traffic travelling down the freeway that must give way. No wonder there are hundreds of fatalities a day on the roads here. Another worry is the pedestrians that just walk out on to a road without looking. they step out from between cars, wandering onto the road like Brown’s cows. Sometimes, when they are half way across the road they look around, and if they see a foreigner bearing down on them on a bicycle, they panic and stop dead in their tracks. Yelling at them in English does not help, but it relieves the stress a little. The most common place for cars to park is directly on the corner of an intersection. In Dali Old Town the cross-roads are the most challenging. Picture this, you have a high volume of traffic (buses, cars, trucks, tractors, motorbikes, electric scooters, bicycles and and horse-drawn carts), all four corners of the intersection are choked with parked cars, there are no stop or give way signs, and pedestrians just wander out into the traffic. Truly exhilarating stuff. The website is almost finished (www.intrepidcycle.com) if you would like to take a look. The content of the website is of interest to anyone considering doing a cycling tour, please feel free to pass the link on to anyone you know who might be interested in it. I’ll be switching from the mass-email to my blog (The Intrepid Cyclist – hat-tip to Paul Eate for inadvertently providing the inspiration for the name). If you would like to receive the blog entries as emails you can register online at http://intrepidcycle.com/intrepid-cyclist/subscribe-to-intrepid-cyclist/ . You can unsubscribe at any time by using the same link. Also a friendly reminder that I will be raising money for the Cancer Council of Victoria to fund research into a cure for melanoma. We are almost ready to accept donations, so dig deep my friends and help support this important cause… that ends the spruik, but seriously if you want to help raise money alongside my bike trip, use the contact us page to send me a message. Good to read that you’re almost starting your big trip. I’m sure this is going to be one big adventure and I wish you the best of luck getting all the way to Melbourne!